, a very ingenious and learned critic, was descended from a good family, and born at Muret, a village near Limoges, in France, April 11, 1526. 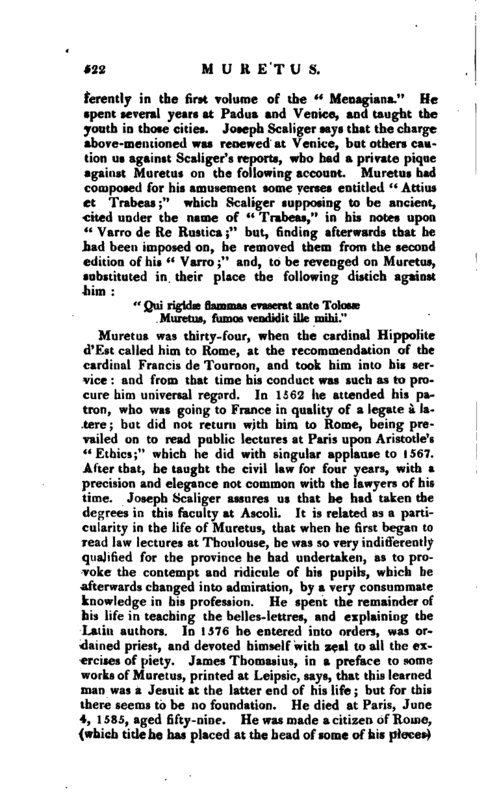 We know not who were his masters, nor what the place of his education; but it was probably Limoges* JJencius, in his funeral oration on him, and Bullart say | that be spent his youth at Agen, where he had Julius Caesar Scaliger for his preceptor; but Joseph Scaliger, his son, denies this, and affirms that Muretus was eighteen when he first came to Agen, to see his father. He adds, that he passed on thence to Auch, where he began to teach in the archiepiscopal college, and to read lectures upon Cicero and Terence. 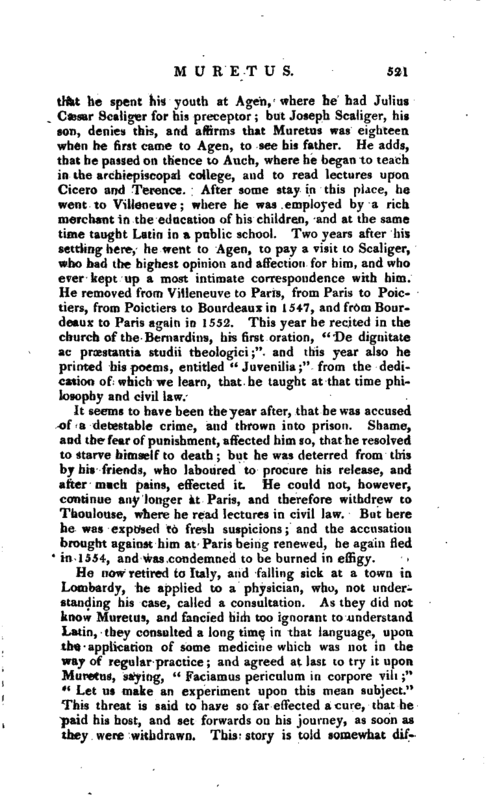 After some stay in this place, he went to Villeneuve; where he was employed by a rich merchant in the education of his children, and at the same time taught Latin in a public school. Two years after his settling here, he went to Agen, to pay a visit to Scaliger, who had the highest opinion and affection for him, and who ever kept up a most intimate correspondence with him. He removed from Villeneuve to Paris, from Paris to Poictiers, from Poictiers to Bourdeaux in 1547, and from Bourdeaux to Paris again in 1552. This year he recited in the church of the Bernardins, his first oration, “De dignitate ac praestantia studii theologici;” and this year also he printed his poems, entitled “Juvenilia;” from the dedication of which we learn, that he taught at that time philosophy and civil law. It seems to have been the year after, that he was accused of a detestable crime, and thrown into prison. Shame, and the fear of punishment, affected him so, that he resolved to starve himself to death; but he was deterred from this by his friends, who laboured to procure his release, and after much pains, effected it. He could not, however, continue any longer at Paris, and therefore withdrew to Thoulouse, where he read lectures in civil law. But here he was exposed to fresh suspicions; and the accusation brought against him at Paris being renewed, he again fled in 1554, and was condemned to be burned in effigy. Muretus, fumos vendidit ille mihi." Muretus was thirty-four, when the cardinal Hippolite d’Est called him to Rome, at the recommendation of the cardinal Francis de Tournon, and took him into his service: and from that time his conduct was such as to procure him universal regard. In 1562 he attended his patron, who was going to France in quality of a legate a latere; but did not return with him to Rome, being prevailed on to read public lectures at Paris upon Aristotle’s “Ethics;” which he did with singular applause to 1567. After that, he taught the civil law for four years, with a precision and elegance not common with the lawyers of his time. 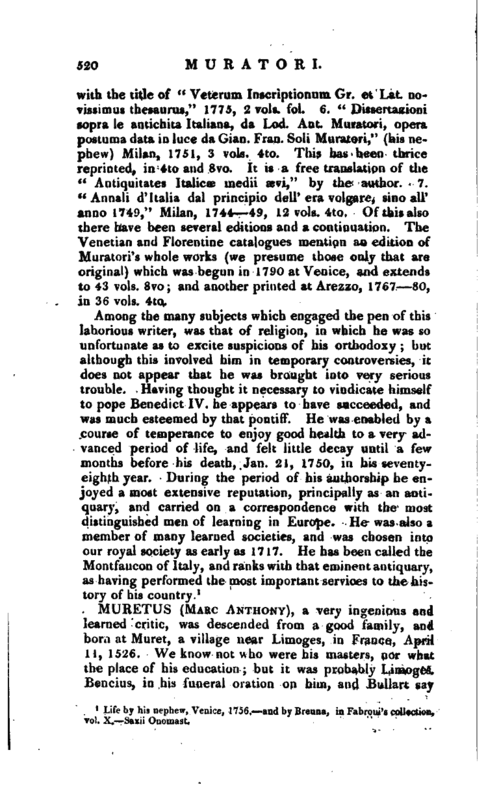 Joseph Scaliger assures us that he had taken the degrees in this faculty at Ascoli. 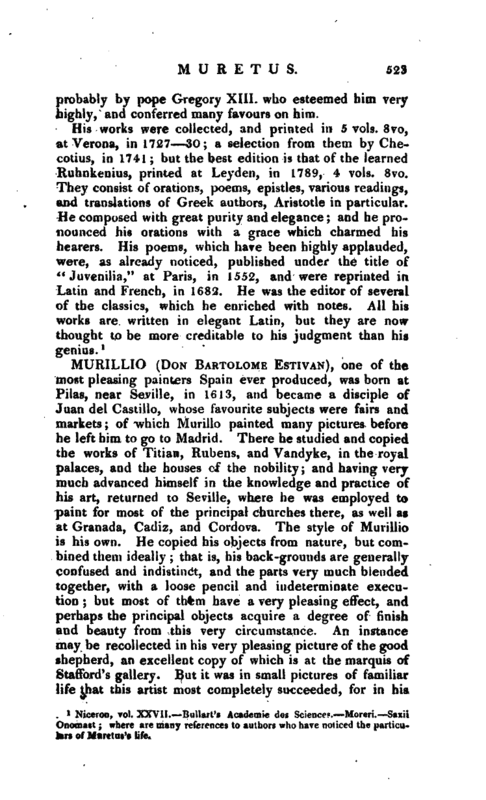 It is related as a particularity in the life of Muretus, that when he first began to read law lectures at Thoulouse, he was so very indifferently qualified for the province he had undertaken, as to provoke the contempt and ridicule of his pupils, which be afterwards changed into admiration, by a very consummate knowledge in his profession. He spent the remainder of his life in teaching the belles-lettres, and explaining the Latin authors. In 1576 he entered into orders, was ordained priest, and devoted himself with zeal to all the exercises of piety. James Thomasius, in a preface to some works of Muretus, printed at Leipsic, says, that this learned man was a Jesuit at the latter end of his life; but for this there seems to be no foundation. He died at Paris, June 4, 1585, aged fifty-nine. He was made a citizen of Rome, (which title he has placed at the head of some of his pieces) | probably by pope Gregory XIIL who esteemed him very highly, and conferred many favours on him. Niceron, vol. XXVII. Bullart’s Acatlemie des Science?. —Moreri. —Saxii Onomast; where are mauy references to authors who have noticed the particulars of Muretus’s life.